When Pew Research Center sought out ways to measure the amount of trust a news organization has, we quickly found that a news source’s level of trust and distrust is heavily influenced by brand reputation. For nearly all 36 outlets we asked our survey respondents about, more people had heard of the outlet but not gotten political news there in the past week than had heard of it and also gotten news there. For example, 80% of web respondents have heard of The Washington Post, but only 8% had used the Post as a source for political news in the past week, leaving 72% who had heard of it but had not read it within the past week. Many respondents who knew of but didn’t get political news from a source in the past week abstained from voicing a sense of trust or distrust. (In the Washington Post example, just over half of that 72% expressed neither.) But it turns out that those who did weigh in one way or another often determine the sources’ overall balance of trust to distrust level. Among those who had gotten news from each source in the past week, there is in nearly every case more trust than distrust. But among those who don’t get their news from a source we asked about, there is no such consistency. Some sources are more trusted than distrusted, while for others, distrust predominates. For example, among those who have heard of CNN but did not get news there, expressions of trust and distrust are roughly equal – 37% trust and 33% distrust. (Fully 80% of those who heard of it and consumed it say they trust it.) PBS, however (trusted by 84% of those who got news there in the past week), was roughly twice as trusted as distrusted outside its core audience (34% v. 16%). Higher levels of distrust were common among non-consumers of news sources that attract more ideologically aligned audiences. Al Jazeera America, with its 71% left-leaning audience, has considerably more distrust than trust among those who have heard of it but did not get political news there in the past week: 40% to 14%. For The Glenn Beck Program (87% of its audience is right-leaning), the gap is even greater: 55% of those who know it but don’t get news there distrust it, while just 12% trust it. Taken together, this suggests that this sense of trust or distrust may not actually stem from an individual’s recent exposure to news content. Instead, it may flow from any other information they may have about the news source – whether that comes from friends, family, other media or a past experience with it. 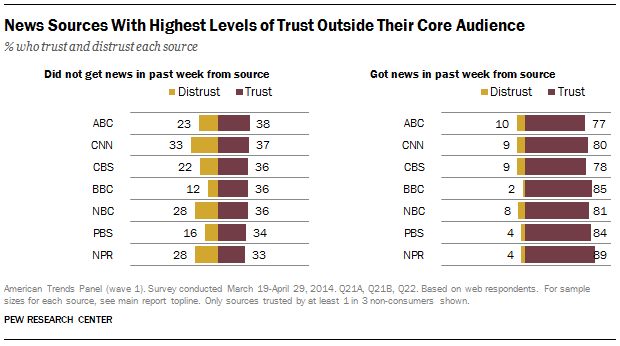 Which news organization is the most trusted? The answer is complicated.